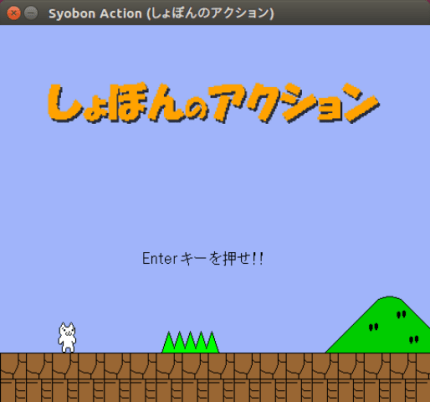 Open Syobon Action (オープンしょぼんのアクション) is an open-source cross-platform port of the unforgiving Japanese platformer using SDL. It is also called "Shobon no Action," "Neko Mario," "Cat Mario," or "Cat MeOUCHio." Rather than just playing this game by yourself, it is much more enjoyable to let someone who's never tried it before try playing the game. Those who are under 12 years old are not allowed to play. Please be aware that by playing this game, there is a possibility that you may develop trust issues towards other humans. Please be aware that there is a possibility of getting stressed out while playing this game. If any problems are caused by this game, please understand that the developers cannot take any responsibility. If you wish to distribute this game to a large amount of people, please give credit to the original developer, Chiku (ちく). The game's text is entirely in Japanese, but you do not need to understand the Japanese language in order to play. This snap is maintained by the Snapcrafters community and is not endorsed or officially maintained by the upstream developers.